The financial services industry faces significant competitive pressures. Economic and political influences, incessant regulation, and fast changing markets make for a highly complex and dynamic environment. Thus, banks and insurance companies are forced to permanently improve their performance – raising process performance represents one of the biggest levers for success. 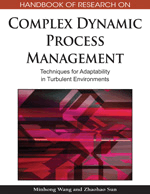 This chapter analyses the challenges of operational process management for banks and insurance companies. The involvement of customers in service processes of financial institutions make these not as easy to manage as production processes. In response to these challenges, cornerstones for a general framework for operational management of service processes will be developed. The aim of this chapter is to present a framework for structuring service processes which allows combining influences by customers and an operational process management. The concept is based on the modularisation approach and will be demonstrated using a loan process as an example. The assembly line concept represented the genesis of the idea to regard the activities of an enterprise as processes. Processes are thus viewed as sets of activities with the logical internal relationship that they result in a product or service demanded by a customer (Hammer & Champy, 1993). The process therefore begins and ends with the customer. Processes exist irrespective of the functional structure of the organisation. According to this view, the loan process, for example, encompasses sub-processes such as sales, loan application processing, loan approval/rejection, customer service, risk management, and workout (end-to-end process). In order to continuously enhance process performance, the process has to be viewed and managed in its entirety as an end-to-end process. In doing so, the special characteristics of services and service processes have to be considered. Operational Process Management: As part of a comprehensive business process control structure, operational process management consists of three phases: process measurement, process control, and process improvement. Heterogeneous Integrativity: The necessity of involving the customer (“external factor”) in service production constitutes a major difference from mass production of physical goods. The degree of customer integration within a service process differs with respect to the dependence on the information needed and on the type of service. Financial Services Industry: Commercial banks, investment banks and insurance companies comprise the major share of the financial services sector. The work is performed by central banks, stock exchanges and regulatory authorities. Service Process: As compared to manufacturing, a service process results in the delivery of non-physical goods. Thus, there is no assembly line, and machinery usually plays a minor role. However, intensive involvement of human resources and information technology is crucial. Modularisation: The concept of modularisation is used for reducing the complexity of a system. This system (e.g. business process, organisational structure, IT application) is deconstructed into more or less independent units (“modules”). The modules should be able to exist independently from each other, but the system as a whole can only function as an integrated structure. Loan Process: This is considered to be one of the core business processes in banking. The loan process comprises the following sub-processes: advisory and sales, processing of the application, loan approval/rejection, loan processing and servicing, risk management and monitoring, and workout. Framework: A framework is an instrument to identify relevant variables and the relationship between them for a specific practical question. It consists of a combination of deductive models and inductive based case studies. A framework needs to be adapted to many different situations and therefore delivers a set of alternatives.